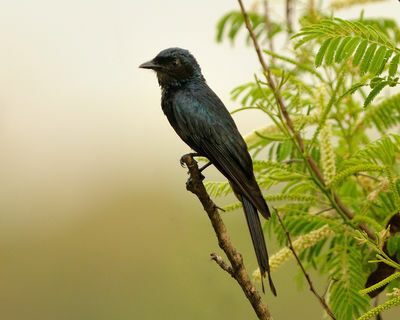 The drongos are a family of small passerine birds of the Old World tropics, the Dicruridae. This family was sometimes much enlarged to include a number of largely Australasian groups, such as the Australasian fantails, monarchs and paradise flycatchers. The name is originally from the indigenous language of Madagascar, where it refers to local species, but is now used to refer to all members of the family. The family is usually treated as having two genera, Chaetorhynchus and Dicrurus. The genus Chaetorhynchus contains a single species, the New Guinea endemic Pygmy Drongo.